With the assistance of their booking agent and devoted fan-base, CATTLE DECAPITATION is starting a mini-tour throughout the Northeast dubbed the “By the Fans, For the Fans” tour, which begins tonight (11/08) in Lowell, MA. See below for dates and venues. 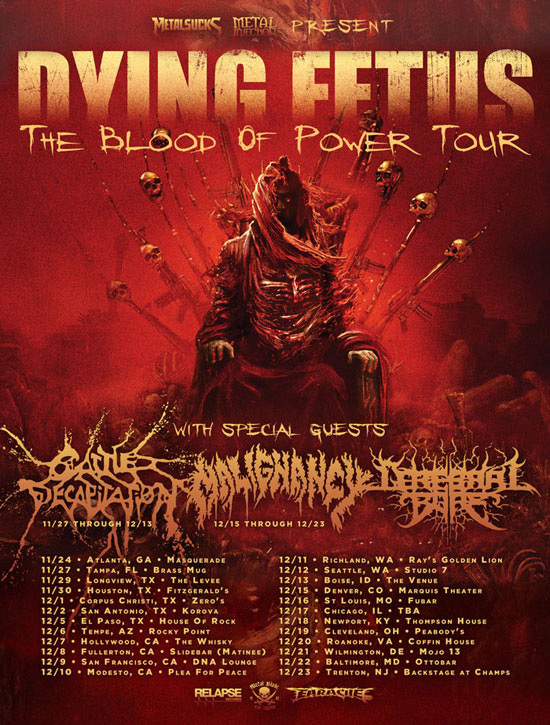 The mini-tour will lead into the CATTLE DECAPITATION’s dates joining Dying Fetus on “The Blood of Power Tour,” which kicks off on November 23 in Springfield, VA at Empire. The show on 11/11 at Reverb in Reading, PA will be free for ticket holders of The Autumn Apocalypse show hitting the same venue on 11/08, just pick up your tickets the day of the 11/08 show.